I love me some Vegan Coconut Rice Pudding. I don’t know about any of you guys, but it’s always been one of my fave snacks to eat. I like it with blueberries, with raisins, with pecans or walnuts, it goes with just about anything really. And although it’s rice and I know peeps can be afraid of the carb this is not bad for you! It’s made with organic white rice but can be easily made with brown rice if you prefer. This cooks right in the coconut milk so there’s no watery consistency and it comes out super creamy and dreamy, every rice pudding lovers true desire. I’ve played around with rice pudding recipes in the past and they’ve come out tasting pretty meh. Like bleh and meh. Through some trial and error I learned that you don’t need refined sugar to sweeten this bad boy up. Here are your options: maple syrup (which is what I used), agave nectar, coconut nectar, brown rice syrup, or if not vegan honey. I’ve used both brown rice syrup and maple syrup and maple syrup won for me, however your tastebuds might be different. No probs. 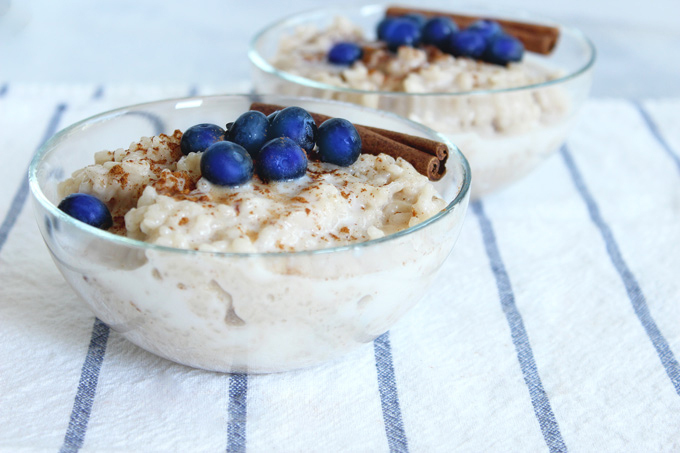 I topped this one with some cinnamon and blueberries making this vegan coconut rice pudding the perfect sweet comfort snack. On top of it being vegan it’s also gluten free! And May is Celiac Awareness Month. Rice is naturally gluten-free and one of the least allergenic grains. Since I know all of you are on the lookout for healthier, nutritious desserts, I whipped this up! 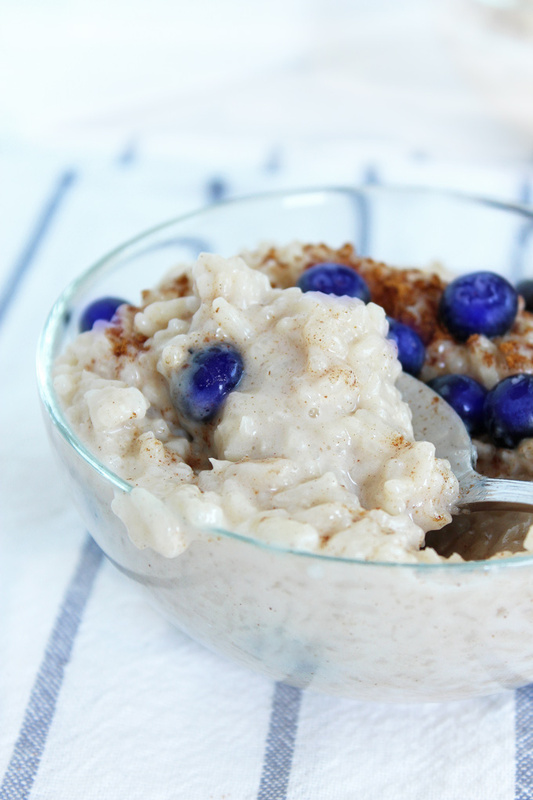 Watch this video to see how easy this Vegan Coconut Rice Pudding is to make! 85% of the rice we eat is US-grown! Farmers in AR, CA, LA, TX, MS & MO grow 18 billion lbs of rice each year. Enriched white rice and whole grain brown rice are staples in many cooking styles and cuisines, proving that flavor and nutrition don’t have to be sacrificed when following a gluten-free diet. Complex carbs, such as rice, supply energy to fuel your body and brain. Whole grains, such as brown rice, help reduce the risk of chronic illnesses, including heart disease, diabetes, and certain cancers. Rice provides more than 15 essential vitamins and minerals, including folic acid, B vitamins, potassium, magnesium, selenium, and fiber (brown rice), as well as iron and zinc. Research shows that people who consume rice tend to have healthier diets – they eat more fruits and vegetables, less sugar and saturated fat. 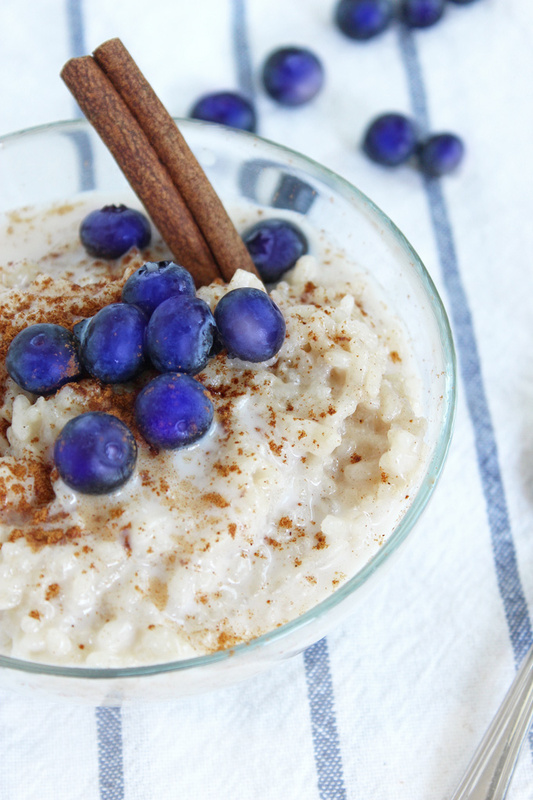 Who knew all this could be in a single serving of a sweet and healthified rice pudding!? A healthy, vegan and gluten free snack can be made with white or brown rice and is cooked in coconut milk. Pour one can of full fat coconut milk into a medium size sauce pan and bring to a boil. Rinse and drain the rice well then add it to the boiling coconut milk. Let it boil for 5 minutes, cover, then lower down to a simmer for 20 minutes. Continue to cook for another 10 minutes. The rice will have absorbed a lot of the milk. If you'd like it a little more creamier add another 1/2 cup of almond milk. Stir frequently so the rice doesn't stick to the bottom of the pan. At this point you can also add more cinnamon if desired. Remove from heat and let cool for at least 5 minutes. 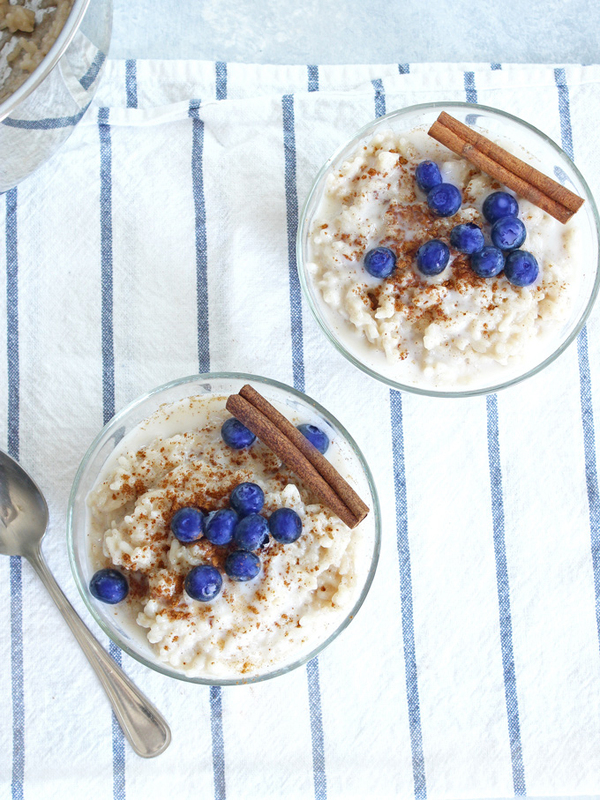 Serve in glass bowls or cups, top with blueberries, extra cinnamon, and coconut whip. You an eat this immediately or I like to store it in the fridge until it's cool. For extra creaminess once cooled, pour a little bit of almond milk over the top. Serve and Enjoy! Keeps well in the fridge for up to 4 days in air tight containers. You can heat this up before serving if desired.